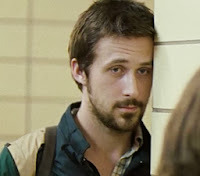 Written by Anna Boden and Ryan Fleck - and directed by Fleck - Half Nelson trades glimpses of hope and despair, paths forged and those not yet paved, beautifully rendered in its aching and arching sympathy. I first saw this in the theater, with my best girl beside me. She has since moved on. Perhaps to other people and places. Maybe better, but probably not. ...Definitely not. Anyway... My second viewing awakened the picture's endearment. Something that I either missed or misunderstood the first time around. 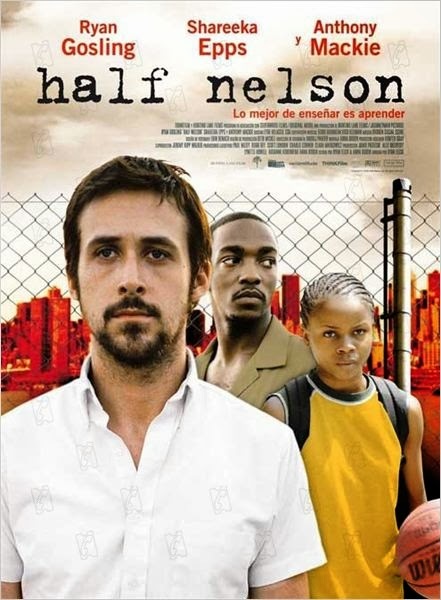 It's about middle-school history teacher and basketball coach, Dan Dunne (Ryan Gosling), who also happens to hit the pipe hard, and his faithful student and star player, Drey (Shareeka Epps). Dan is a leaning lamppost, reaching for support and finding needed comfort in his classroom and the gym, spoiled by in-between highs and the disappointment of his former flame now wearing somebody else's ring. He drinks alone at bars, trying to make himself available, and messes around with his co-worker, Isabel (Monique Gabriela Curnen). He doesn't really fit in anymore at home, where his brother has found love and his parents are blissfully oblivious in shallow ratcheting and rude superiority. And Dan's eternally working on an illustrated children's book, intermittently sucking in doses of confidence and motivation, only to fall flat again and again. He never apologizes for who he is. He just suffers the dead end, backing out enough to face a new day the same way he did before. Drey is the charge to Dan's waning will. Their bond formed by the appealing and appalling when she finds him freebasing in the girl's bathroom, pale-faced, glazed over and beading. It's a near-perfect scene. Amazingly fresh and frightening. Both a desperate reflection of lost courage and a warming reminder of human compassion, as we watch Drey wipe the sweat from Dan's forehead while he lies on the floor, paralyzed by the chemicals racing through him. We're never given a reason for Dan's habit. We only know he shows to work under the stench of suspicious eyes and smug lip curls, and the only heart he finds is in Drey when he has no right to expect it of anyone. Not even Isabel, who manages to make the effort, but is driven away by Dan's regretful attempt to re-light the lust. affection by Frank (Anthony Mackie), the neighborhood dealer who provides a supplemental income, while Drey's older brother is doing time on Frank's behalf. Whether fueled by guilt or fear of abjection, Frank looks out for Drey, even if he's cutting coke in front of her or taking her on runs. He also warns Drey against getting too close to her base-head teacher. Frank's unsolicited confrontations with Dan are never menacing or mean-spirited. Instead, the two understand each other. They understand that Drey needs their guidance to have a shot. Or maybe they realize that she doesn't need them at all. That maybe the way to "do something good," as Dan painfully shouts at Frank, is to let her be. But, Drey isn't easily sidelined. She sees through Frank's doings and isn't rattled by his sneaky set-up to catch Dan in the act again, in some fleabag motel room with other casual druggies. And she won't lose Mr. Dunne to the gutter. Her Mr. Dunne. Epps and Mackie are fantastic, and Gosling is the real deal. He plays needy and nothing with a wrenching fulfillment that's tangible and touching. Epps is a young person, mature and meaningful, and not just a childish speck lost in the Brooklyn jungle. And Mackie is a diamond find as a sensitive drug dealer, dueling drudgery and doling goodwill. I haven't seen the subsequent Boden and Fleck films, like Sugar (2008) and It's Kind of a Funny Story (2010). Although I hear good things, I can't help to feel that I'll be let down. That's not meant as a knock on those other movies. It's only meant to say just how good Half Nelson is.